The President, Shri Ram Nath Kovind addressing at the 45th Institute Annual Convocation of the All India Institute of Medical Sciences (AIIMS), at AIIMS, in New Delhi on January 16, 2018. The Union Minister for Health & Family Welfare, Shri J.P. Nadda is also seen. 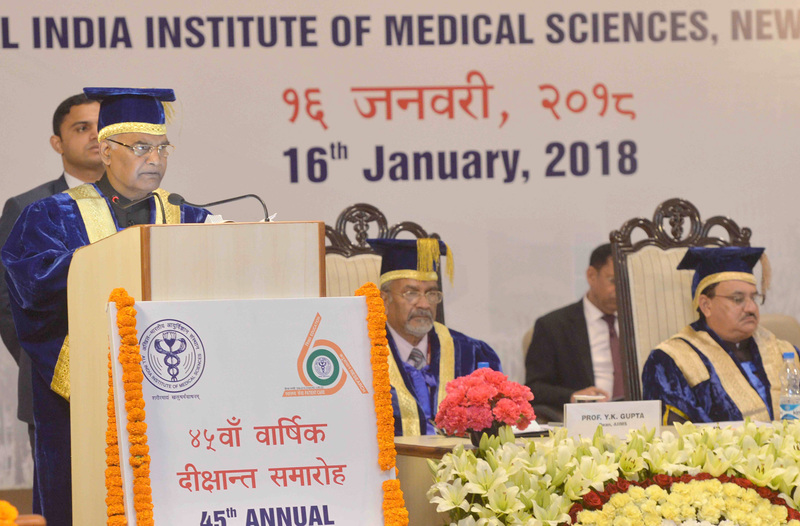 New Delhi: President of India, Shri Ram Nath Kovind, graced and addressed the 45th convocation of the All-India Institute of Medical Sciences (AIIMS) in New Delhi today (January 16, 2018). Speaking on the occasion, the President said that AIIMS is a national centre of excellence. In medical research and healthcare, it is a model for the country. The name “AIIMS” has become a byword for quality, commitment and rich experience. The faculty and doctors, as well as of course the students, are the pride of our medical fraternity and our nation. The President advised the graduating doctors that as they go into the world – a world that needs their services more than ever before – they should remember that they need to give back to society. He stated that it is true that they need to be legitimately rewarded for their academic excellence, their medical skills and their expertise. Yet, as doctors, their services must be available both to those who can afford their fees and also to those who are less fortunate and cannot. Disease does not distinguish between rich and poor but unfortunately the poor suffer the most. It is for society to profit from medical science – it is not for medical science to profiteer from society. Pointing out the shortage of doctors in our country, the President said that doctors need help in the form of more colleagues. And this is where we need a new regulatory system to enhance availability of doctors and medical professionals in our society. In the absence of this, the work-load on our doctors is very high. The President said that currently our medical colleges, whether run by the government or private institutions, have only about 67,000 undergraduate seats and 31,000 postgraduate seats. In a country of 1.3 billion people this is highly inadequate. We have to overcome regulatory bottlenecks and interest groups that have prevented the growth of quality medical education in our country. This gives us far fewer medical graduates and postgraduates every year than our people need. It also leads to aspiring medical students seeking admission in colleges in other countries – simply because they have limited options at home. This is simply not acceptable. As a nation, we need to address this situation very urgently. We need to create more opportunities for those young people who want to make medicine their calling.